Labels are everywhere: in our offices, for example, they’re used for organising things and sending letters and parcels, while in supermarkets, they’re used to customise the look of bottles of wine, beer and other products. If you’re looking for a label software to use at home or at your company, you’re in the right place: this is our guide to the best software programs for printing labels! Here we’ll explain how to print labels from Excel and Word, and how to use highly intuitive software for creating labels online, like Canva or Adobe Spark! A very useful label software – and one which is probably already installed on your PC – is Microsoft Excel. You can print labels from Excel, especially if you are dealing with information contained in big databases or tables. Compared to printing labels from Word, with Excel what you lose in terms of label customisation you gain in preparation and printing speed! Now let’s see how to print labels from Excel. First, you need to arrange the label information in the spreadsheet into several columns so that it fits the sheet on which it will be printed. Imagine that you’re printing in a very common format – an A4 sheet with 24 labels each measuring 70 x 36 mm. In this case, you should divide the database that you’re printing into three columns. Now let’s go to Page Layout to preview what we’re printing. Selecting all the cells, set the height and width of each cell: in this case it’s 36 mm and 70 mm respectively. Now set the margins to 0 in the Margins > Custom Margins section and, in the same window, tick the “Horizontally” and “Vertically” boxes under “Center on page”. Now you can print your labels from Excel. We recommend that you first do a test print on a normal sheet of paper, place it over your label sheet and hold it up to the light to check whether the margins need adjusting further. Using Word as your label software gives you more customisation options: you can easily change your label’s background, colour and font size, and even add images. What’s more, printing labels from Word means you can use hundreds of pre-set templates, either as they are or modified to your requirements. Let’s see how. When you create a new Word document, beneath the search bar, you’ll see the category Labels (you can also type “labels” into the search bar). From the list, you can choose the type of label you want: shipping labels, CD labels, jar labels, gift labels, even political campaign bumper stickers. At this stage, you can manually change the label content by inserting your text and then printing. If, however, you have to use an external database that holds the information you want to print on the labels, you should use the Mail Merge tool. 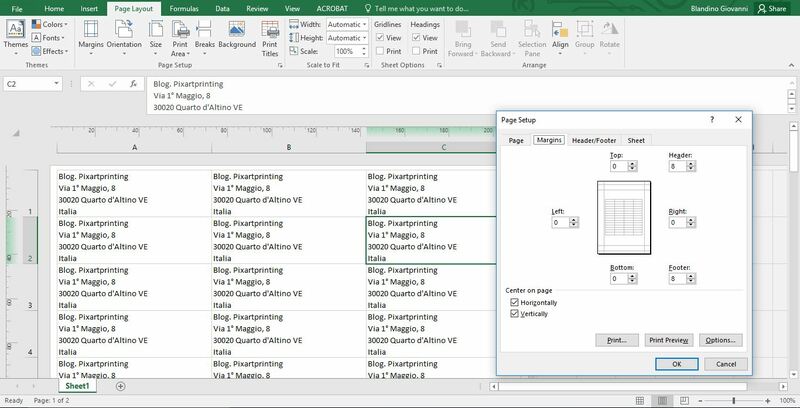 This lets you link an Excel database to the Word file containing the labels you want to print. Here’s how. First, you need to prepare the Excel table. There are a few tricks to this: the most important is to divide the information you want to put on the labels into different columns (for example: name and surname, address, personalised message). In the first row, write a description of the information contained in that column. Now create a new Word document, and in the Mailings section, select Start Mail Merge > Labels. Here you can select the type of sheet to print on or customise one. Once you’ve created the label sheet, select the Excel list with your information by clicking Select Recipients > Use an Existing List. Now, on the first label, you can add the fields that you want printed (e.g. Name and surname, address) using the “Insert Merge Field” button. You can also insert images, graphics and change the background colour. When the first label is ready, click on the Update Labels button. To see what your labels will look like, click on the “Preview Results” button. Now you’re ready to print your labels by clicking the Finish & Merge button! Let’s move on to a highly intuitive online label software: Canva. This program for creating labels is free in its basic version and offers hundreds of great-looking templates. Once you’ve picked a template you like, you can customise it in a highly intuitive manner by dragging and dropping elements, positioning photos and illustrations, changing the text and adding filters to your label. If you want to change the label’s dimensions, however, you’ll have to take out a premium subscription. The same goes for using the templates and photos that aren’t marked “free”. Another useful feature is the ability to collaborate with other users on the same project, if you’re working in a team. Finally, you can download the label in .png, .jpeg or .pdf format ready for printing. Another very intuitive label software is Adobe Spark. This program for creating labels is free and based on an online platform: simply sign up – you can even use a social media account – and access the free version. We particularly recommend Adobe Spark as label-printing software for beer and wine bottles, so long as you don’t have strict format requirements (customising the format is difficult). On the other hand, in just a few clicks, you can create a label with a very modern design. In the Layout section, you can arrange the elements of your graphic in a matter of clicks and, if the “Magic layout” option is enabled, the program will automatically re-organise the different elements (name, logo and other information) to create decidedly trendy graphics. 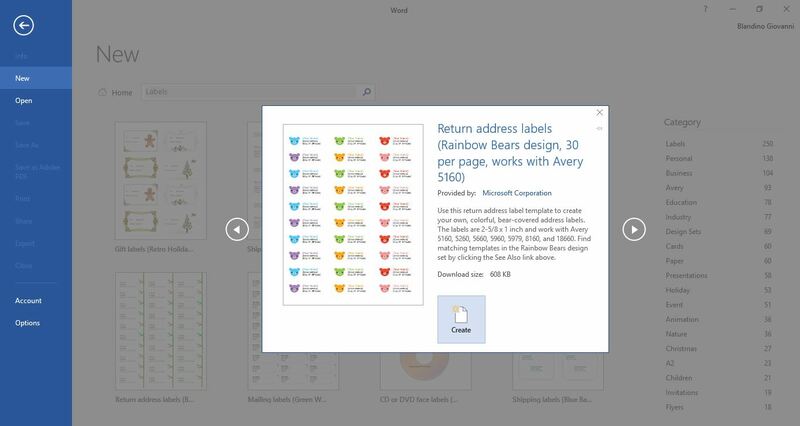 A label program especially useful for businesses is Labeljoy, particularly if you’re dealing with information stored in a database (for example, a list in Excel or CSV format) and you have to add bar codes or QR codes to your labels. There’s a free demo version for testing the software, but it will add the watermark “trial” to your labels. Paid versions start from €39. 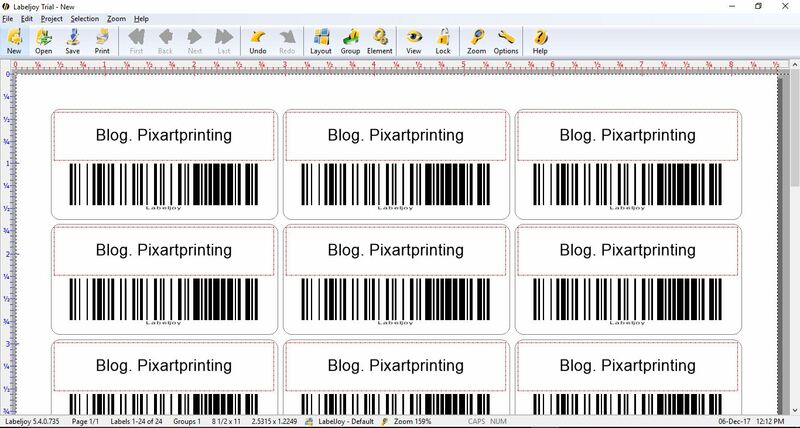 The full version of Labeljoy is a very powerful label program: you can choose from practically any label sheet on the market when setting your layout or customise it to your own dimensions. The software can connect to major database formats (including Access, Excel, Outlook, Sendblaster, Oracle, Sql Server and MySql) and uses many types of bar code. And now for a completely different label program: Beer Labelizer. As its name suggests, this software is specific for creating beer labels. You can choose from 17 templates whose text you can modify and to which you can add images. Customisation options are pretty limited, but it’s a fun and original label program. To use all the templates, you’ll need to take out a subscription for $1 a month or $8 for life.